Sandveld Organics is situated near Lamberts Bay, on the West Coast, two and a half hours drive from Cape Town. With vast stretches of still unspoilt veld and coast the area is a good place to get in tune with nature. It is not an easy place to live, the soil is but sand, strong winds and hot summer temperatures pose daily challenges. But then, after good winter rains, the veld erupts like magic into an abundance of colours and flowers that attracts visitors from all over the world. The coast’s estuaries and pristine beaches are popular destinations for Bird Watchers, Surfers and Divers alike. We have embraced tourism as an opportunity to share our farm life and the beauty of our surrounds with visitors. 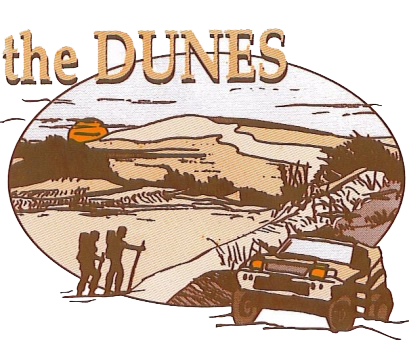 The main attraction on our family’s property is "the Dunes" - this outdoor playground of sand dunes is a well-known 4x4 route and hiking destination. These outdoor activities are complemented by the Bauernstube, our fully licenced Bush Pub. During high season we are open daily, else by appointment, for private parties or corporate functions. Enjoy the beauty of nature, a magic place that still lacks conclusive explanation of its origin. Listen to its majestic silence, wonder across the valleys and hills of snow white sand dunes. In the surrounding virgin veld, watch birds and animals in unspoilt habitats, sketch the famous West Coast diversity of flowers and trees, search for insects, reptiles and everything else that crawls and flies. Discover genuine Sandveld hospitality in our bush camp or in the Bauernstube Bush Pub. Let your people be spoilt with traditional dishes that have been simmering in the potjie for hours, braaing on the coals just long enough. Visit our Bauernstube bush pub and relax in the peaceful atmosphere of our farm. Let us spoil your family, team mates or colleagues. The Bauernstube is fully licenced. Our cosy restaurant seats 20 people inside and 12 people outside in the shade. We have a small Bar area and a large fireplace for cold winter evenings. Audio and Video facilities/TV are available. We cater on request, traditional Sandveld dishes and Braais are our specialities. We are located 10 km outside Lamberts Bay on the Road to Clanwilliam (take the ‘’Dunes’’ turnoff. Geniet die Lekker Landlewe ! Kom maak ‘n draai en kuier by ons “Bauernstube” boskroeg in rustige atmosfeer op die plaas. Jou familie, friende of kollegas sal die uitstappie besplis geniet. Ons boskroeg is ten volle gelisensieërd. Die restaurant het plek binne vir 20 persone en 12 persone buite op die stoep. Ons het ‘n klein Bar gedeelte en ‘n groot, oop kagel vir koue winter aande. Video/TV fasiliteite beskikbar. Skakel vooraf vir boerekos en ander lekker disse. Ons is geleë 10 km buite Lambertsbaai op die Clanwilliam pad. Kyk uit vir ‘The Dunes’ se afdraai.